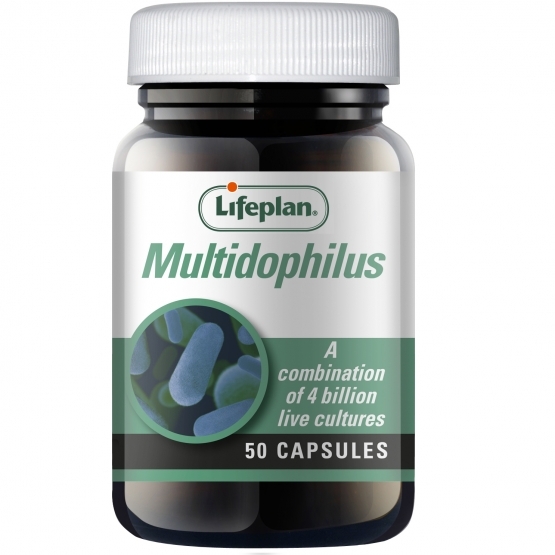 Lifeplan Multidophilus is a live culture supplement providing 4 billion colony forming units per capsule. Provides both Lactobacilli and Bifidobacteria. Take one to three capsules daily, preferably before a meal. Lactobacillus rhamnosus, Vegetarian Capsule Shell (Hydroxypropyl Methylcellulose), Lactobacillus acidophilus, Lactobacillus casei, Bifidobacterium breve, Antioxidant (Ascorbic Acid (Vitamin C)). added sugar, salt, starch, yeasts, flavourings or colourings. Multidophilus x 50 has been added to your basket.